In case you’ve been living under a rock for the last five or so years, you should know that e-books are taking the techie and literary world by storm. I’m hardly a tech freak – new electronics are essentially just to new toys for me to abuse and try not to break/lose… But I can’t help but be enthusiastic when it comes to e-readers and e-books. After all, they combine my two favorite things – Toys and books (I’m really just a grown-up child). 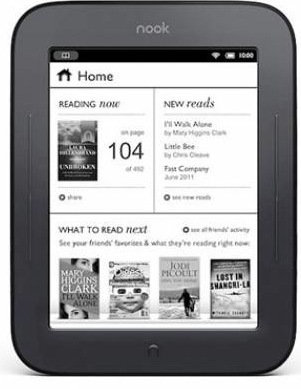 My newest toy (that I’ve taken very good care of, by the way) is my Nook Simple Touch, one of the many e-readers on the market. The screen is all of six inches which makes this bad boy easy to tuck into a backpack or purse and weighs next to nothing. So instead of toting around your enormous sack of learning all over the place with three unnecessarily heavy textbooks in it, consider this fresh gadget of excellence. If the concept of saving your poor back alone doesn’t persuade you, how about saving your sanity? It’s a lucky day filled with triumph when I show up to class or my designated study space (a coffee shop, a friend’s, etc.) with all of my vital materials. Ironically, it’s always the most important material, the textbook, that I forget. I drop all of $100 on the Nook Simple Touch and suddenly, I never have to worry about forgetting a textbook again. Every single textbook for my classes this semester have been available as an e-pub/e-book. If it just so happens that yours isn’t, shoot an email to the publisher! Barnes and Nobles has a clickable link for interested consumers to send publishers emails if their book is not available in a digital format.